This book starts to fill that void. It’s been a long time coming — it’s the product of eight years of research and writing by 14 authors across 6 countries. “Thoroughly original…Anyone interested in the future of law and justice will have to reckon with this book." "[A] powerful … guide to understanding one of the most promising emerging fields in the world today… Each individual story is inspiring, and the global potential of this profession to change countless lives is thrilling." -Ricken Patel, Founder and CEO, Avaaz - The World in Action. Do the lessons the book draws about paralegals and legal empowerment ring true to you? How do the experiences described compare with your own? Please share your thoughts with our community here. Thank you very much for sharing. Is there some specific requirement to work as a community paralegal in Canada? 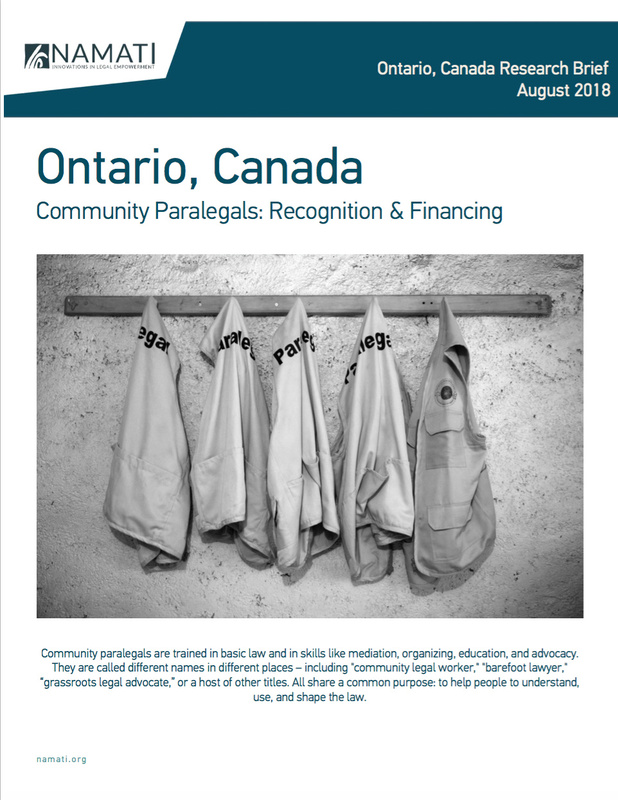 Is it something different from the paralegal occupation which is regulated in Ontario? Thank you very much. Alexandar. @vivekmaru congratulations on the publishing of this book! I’m trying to purchase a hard copy online, but with no luck. 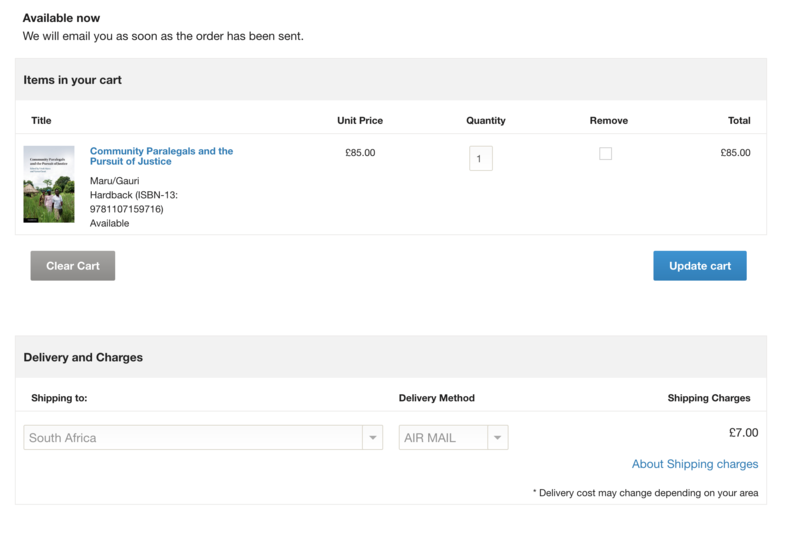 The Cambridge Press site only gives me the option to add it to my “wishlist” but not to purchase. Do you know of a reputable online site where I can purchase a hard copy? I tried to order it on Cambridge Press site and it let me, and gave me an option to ship to South Africa. I am not sure why it wasn’t working for you. Perhaps the page didn’t load correctly. I clicked on the link above, clicked ‘buy the print book’ and it led me to this page. From there, I clicked “add to cart”. When I continue on to the checkout page, it lets me select which country to deliver to from a dropdown menu. See screenshot below. If you try this and still have problems, let me know and I will reach out to Cambridge. Hi Alexandar! You should be able to select @michelemleering and then MESSAGE on the user card that pops up to send her a message via this forum. If you don’t see the MESSAGE button let me know. I clicked the message button but it did not work. Hmm… sorry about that! I will connect with you directly to try to sort this out. Generally, though, talking here in the forum is always better. If you have specific questions for Michele or other members you can mention them to pull them into specific conversations. They will be notified by email, which they can reply to directly. Can the community paralegals give legal advice? The legal community is very protective. But maybe some significant change is underway? The legal services are so expensive. And there are so many needs.